Bradley Weiss from Stellenbosch, South Africa and Flora Duffy from Devonshire, Bermuda captured the 22nd XTERRA World Championship off-road triathlon elite titles on a warm, sunny day in Kapalua, Maui on Sunday. It’s the first XTERRA World title for Weiss, and the fourth in a row for Duffy. With the win, Duffy joins XTERRA Hall of Famer Conrad Stoltz as the only other elite to win four titles, she is the first female to four, and is the only elite to win four straight. Both Weiss and Duffy each earned $20,000 USD for their respective victories. The total purse was $100,000 and the event was filmed for live viewing as well as international distribution. 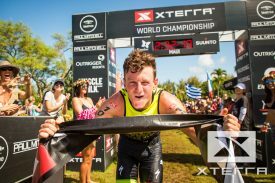 October 29, 2017 (Kapalua, Maui, Hawaii) – Bradley Weiss from Stellenbosch, South Africa and Flora Duffy from Devonshire, Bermuda captured the 22nd XTERRA World Championship off-road triathlon elite titles on a warm, sunny day in Kapalua, Maui on Sunday. It’s the first XTERRA World title for Weiss, and the fourth in a row for Duffy. With the win, Duffy joins XTERRA Hall of Famer Conrad Stoltz as the only other elite to win four titles, she is the first female to four, and is the only elite to win four straight. Mauricio Mendez, the 2016 XTERRA World Champ, was the eventual runner-up. He was expected to be racing from the front, but he was in fourth place off the bike. He then posted the fastest run split, covering the 6.5-mile course in 39:49 to Weiss’ 41:40 and Ruzafa’s 43:41. Ruzafa had the fastest bike split and was the first rider into T2 here in Kapalua for the fifth straight year, but got caught by Weiss early on the run and got reeled in by Mendez just before the last stretch of sand before the finish and ended up in 3rd place. On Thursday, Serrano had a crash on his bike and his shifter got loose, effectively rendering his bike a single speed today on the course. Josiah Middaugh was the top American finisher in Maui for the 10th time and seventh year in a row, and finished eighth. Cedric Fleureton, who unretired from triathlon to reignite his triathlon career, returned to the sport in fine form and finished fifth. “It’s unbelievable. I just had that day. To win here, everything has to go right, you can’t make any mistakes. Everything that I expected to go well went well but I think my swim won the day. I didn’t lose any time in the swim, which was unbelievable. I don’t know how I did it. I just felt so comfortable in the water. I actually caught a wave right at the end. I was just losing the group and I got a wave and caught up to the group and went up and over a couple of guys. I just stood up and saw Ben and Flora and the whole group and thought, “What’s going on?” I got on the bike and the pace wasn’t that strong in the beginning and I knew Ruben and Josiah would be coming and I knew I had to make a gap on Mauricio. He’s proven time and time again he’s putting the fastest run splits in and I think he put three minutes into me so to be able to get a gap on him I had to really go early and go deep, but I still rode very content and within myself and had Dan Hugo out on course giving me splits and keeping me calm and composed and reminding me to do the basics, which were to drink, eat, and just stay on top of hydration. I had a rough week. I literally didn’t sleep almost for three nights. After all the rain on Monday and Tuesday, I went for a swim and just felt incredibly nauseous afterwards. I had some real stomach issues. I went through some deep dark places before the race, before I even got to the race. Perhaps that prepared me mentally a little bit. I thought, I’m going to throw a little caution to the wind and go for it and see what happens. Ruben caught me just before water point two and I knew he was coming and I kept looking back and checking. I knew he was closing the gap, but he didn’t close it that quickly. It took him longer than I expected for him to catch me. Once he caught me I thought hang in there as long as you can. I made a little mistake on the last single track and he got away but he didn’t get that far. I think it was 30 seconds at the end. And I’ll always back my running against anyone – besides Mauricio. I never panicked once. I think that’s what it takes to win this race. Stay composed and stay calm and keep digging deep. It’s my third attempt at XTERRA Maui and everyone who has won has had to come here a few times and have a few disasters and I’m definitely one of them. My triathlon journey started in 2012 and I don’t think I ever thought I could win this race. Even this morning I was in a weird mental space. The sport of swim, bike, run is pretty simple when you think about it. You just have to be the fastest. The truth is I have mixed feelings right now. Having a second place is great but from right now until October 28th next year, I am going to be thinking of one thing and that’s getting that title back. Today was a really tough race in every sense of the word. The swim was tough, I was fighting the whole time. I couldn’t find my rhythm. On the bike we were just fighting. A big group of us started riding together. I tried to do my own race because I was really struggling. On the run, I just knew I was three minutes behind Bradley. I didn’t know how far back I was from Serrano. I just ran my race and at the last climb, I caught Paco and then I got Ruben in the river crossing. I am really happy for Brad. He has been working hard for this. Besides that, we are friends and it’s always nice to see someone like that succeed. The course was perfect. It was hot and fast. I’m confident for what’s about to come. I have age on my side. For this year I’m done, and get to spend some time with family in Maui and have some time and then start training to be stronger. I knew Brad was really strong. I raced with him in Denmark and he rode really fast but I thought about the possibility in the run he could have some problems, but he ran really strong. I ran as hard as I could but Mauricio came the last mile near the beach. Bradley caught me about 1.5 miles into the run, we went together a long time then he pulled away. When we crossed the road, Mauricio caught me at the end. I was almost dead. I am happy because today I didn’t have any problems. The course was dry, no crashes, no problems, all perfect. The swim was good for me today as well, but I want to improve. I caught Bradley on the bike after both climbs on the finish of the downhill about three miles before the end. I couldn’t pull away far. I only got about 20 seconds ahead. I thought it was going to be my day. I think Maui wants to test myself through adversity. I’m not going to give up. When everything becomes perfect I think I’m going to be up there on the podium. I had a crash on Thursday and had some problems on the bike again this year. I was feeling good on the run and I gave my best, but I got some huge blisters and couldn’t push as hard as I wanted on the downhill. It was my best finish so far so I can’t be upset about that. It was a strong field. Mauricio got by me on the last uphill by the beach, on the steep uphill on the pavement. You gotta have your perfect race with every single detail. It was good today, but with that small crash on the bike, I lost my shifter, some blisters. It was an amazing course, everything was so smooth. The ocean was great, a little surf, a nice sunny day, so nothing else we can hope for. It was a nice race. It was a big surprise for me because I don’t know a lot of the other guys. I give the best I can do and I’m very happy. I’m happy about me, about the life, about the sport. I haven’t done this race for 10 years. I’m surprised I did so well. It’s nice. We were looking at some results from years it’s gone well here and I need to be around 2 minutes back after the swim. It made for a really tough day being three minutes back. I wasn’t feeling like I had 100% to give. I’m not sure why. I’ll have to think about that for a while. It was a tough day. I don’t know. It was great conditions and nothing went wrong. Bradley had a couple of great races this year, winning the European Championship. Even in France when I raced over there, he was biking as well as anybody. He was actually putting a lead on people early. Then in Utah, when I caught him on the bike, there was nothing I could do to get rid of him. He was strong. Really good conditions today. The ocean was pretty tame even though I did get smacked by a wave right at the start unfortunately. I made it through the first two waves well and I was in a good spot and I looked up to sight right as a wave crested and tumbled me backwards so I was riding the wave from the wrong direction right at the start. It was a bummer. I don’t know, I felt like I kept hitting the gas but there wasn’t a lot of fight in me physically and mentally. It was strange. I was just really flat out there and it basically became damage control making sure I didn’t lose my 30-minute lead on the double. Right at the beginning those guys rode away from me and I tried to go with them but it became clear to me that I wasn’t going to be able to. I just didn’t have it today. For me the double was the primary goal. Of course, I wanted to improve on my 7th from last year but the big picture, I got the double three years in a row and I’m excited to say that over the last 3 years I’ve had the best time combined – Kona and Maui – and I think that’s kind of special. I’m not super happy with it but there’s silver lining and it’s nice to be able to say that I’m the best of both worlds. I’ve only done one minute of run training the last 4 weeks because I was injured. And that was last night. The bike training has been pretty tough as was the swim. Unfortunately, I got a stress fracture in my pelvis. You know it’s been painful so it was a bummer. It was a challenge to get here. A lot of tears. A lot of frustration but I decided I wanted to come out here anyway because I love the XTERRA family and if I don’t come out here I don’t get to experience it. I just wanted to enjoy the experience. The swim felt good, it wasn’t painful. And the swim has been very painful just with the pelvis rotating. So I was really happy. But running up to the bike it was really painful and I thought, “Oh this is not going to be good.” But then the bike was fine. But I just didn’t have my top fitness and with these girls you have to come with your top game if you want to be competitive at all. And the run was just an absolute survival. It was OK. I had an OK swim. On the bike Flora was on another level, we know that. I’m happy I did everything I could. I was in second place the whole race but Laura did a really good job. She is very strong. She is someone to watch. It’s great to have people like that to bring the level of XTERRA up. It was tough from the beginning, but I was surprised I was fourth out of the water which was good for me. And on the run, I really suffered. From the beginning I couldn’t find any kind of rhythm and I think it was the first time ever that I was walking in a triathlon. But then on the downhill, I felt a bit better. But I can’t complain I took third place and I’m really happy with that. I made up time on Barbara but I never caught her. I had no idea who was behind me. Brigitta and me we started the run together but then I didn’t see her. The water was good, on the first exit I caught the wave nicely. The second exit was hard but for my first real ocean swim I did pretty good. It’s beautiful. I think I will do some more. I will now enjoy some vacation time on the beach. I was very happy when I started the bike and I loved the course. It was dry and it’s really a power course. That’s very good for me but the problem was I drank less so at the end of the bike my legs were cramped. So, the run was like walking and I was very dizzy. I’m very happy to finish. Laura and I came to the transition together after the bike but I was very slow on the run. I did a lot of mistakes after I finished the bike like not enough water. But I am very happy it was the perfect place. Maybe next year. My breathing was good. I think coming down to sea level really helped. The asthma is more part of it than I realized. The inhaler helped. I was good mentally. I never let the breathing get out of control. The course was a little slick in spots but overall it was a fun course. It was a little rough in sections but I had fun on the bike. The age-group athletes impressed as always. The first female amateur was Loanne Duvoisin from Switzerland, who also won the 15-19 age group with a time of 3:17:32. Tanya Sharp from New Zealand was the 40-44 age group world champ and second overall amateur with a time of 3:28:31, and Canadian Heather Pady (40-44) was third in 3:32:37. For the men, Arnaud Taurnelle from France was the first amateur and 17th overall with a time of 2:49:53. Grigorios Souvatzoglou from Greece was the second amateur with a time of 2:51:17, and Pierrick Page from France was the third amateur with a time of 2:52:35. Ben Hoffman won the Outrigger Resorts Double award for the third straight year. The honor is given annually to those who post the fastest combined times in both the Ironman World Championship and the XTERRA World Championship. “I’m disappointed I didn’t improve on my 7th place finish from last year, but winning the double is the silver lining and I’m excited to say I’m the best in both worlds,” said Hoffman, who finished 12th in 2:47:08. His Ironman Kona time was 8:19:26, and his combined time was 11:06:34. Braden Currie was second in the challenge, with a combined time of 11:29:09. He placed 7th in today’s XTERRA with a time of 2:39:03. The top amateur man was Philipp Widmann from Germany with a combined time of 12:50:29. He nudged out last year’s double champ Pablo Ureta from Argentina, whose combined time was 12:51:18, by just 50-seconds. Verena Eisenbarth won the women’s amateur double in 14:15:41.